It's been a pretty big week for the film. I am focusing on the positive at the moment: publicity is going well. The press are starting to report on the documentary and engagement continues to steadily increase on social media. So the fact that, to date, no Zambian business has contributed to the film which is fine coz we managed without them, but now I have no idea how I am going to host the Premiere, which is expected due to the story being told and it being released a week before our 50th Independence Anniversary. It's my job as co-producer to find the money to do things. Honestly, my passion for the story and the film has not translated to funds beyond what I have been able to scrap together over the years from my own pocket through presenting and social media jobs here in Zambia. This has frustrated me greatly as I have tried several different strategies to no avail. You'd think that football, Zambia and the glitz of film would be a no brainer here. I have been proven wrong for the last 2 years. But as Steve Jobs said "stay hungry, stay foolish". With a production partner like Juan, who has gone above and beyond to make this film, and has taken on the lion's share of the financial burden, it's not that hard to do that :). That is also why I changed the Amashiwi quotes on the blog to include Winston Churchill's "success consists of going from failure to failure without the loss of enthusiasm". Even if organisations seem to be swayed by the Chipolopolo's performance and every time I need some help they decided to perform abysmally. I continue support our national team through thick and thin, despite their secret conspiracy to thwart my efforts. It would have been great if they started their AFCON 2015 qualifying campaign with a bang, rather than fizzling out after being paralysed to a nil draw against Os Mambas (The Black Mamba's aka Mocambique) and the venom taking hold by the time they got to Cape Verde last week, losing 2-1. You see my theory is not wholly unfounded and without merit. 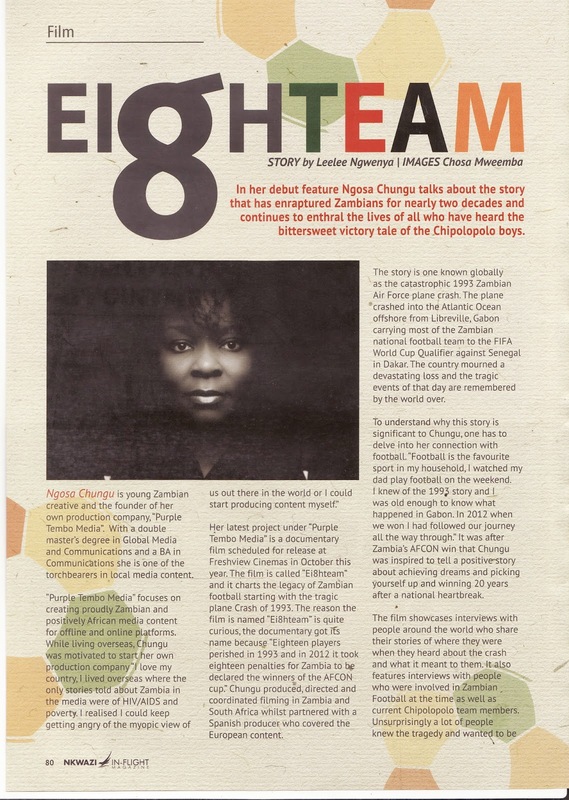 She is behind getting this great article written by Leelee Ngwenya about e18hteam features in the September/ October Issue of Proflight's Nkwazi Inflight Magazine. The magazine is FREE, MAHALA, GRATIS so get your copy to see it in all its glory. 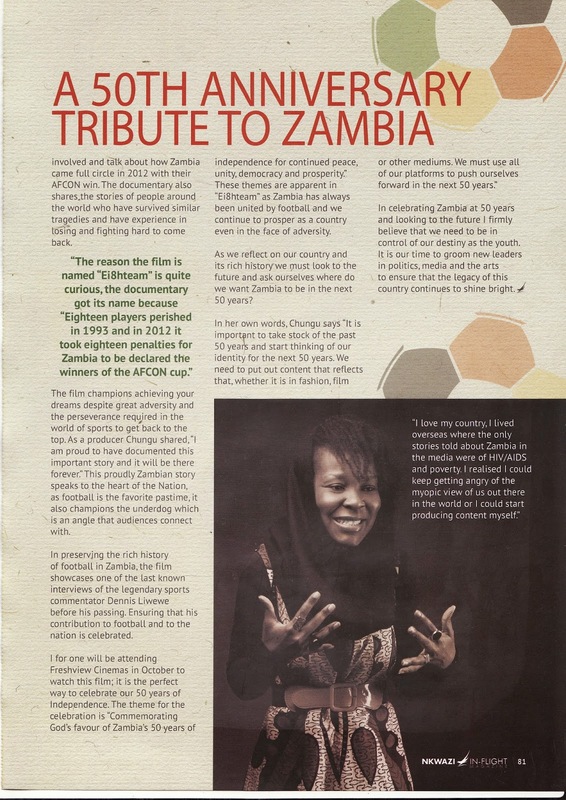 Don't worry, if you aren't in Zambia or flying anytime soon I have scanned the article ;}. Slam Dunk Records TV and Inspire Abantu have posted the press release for the film to help get the word out. This teaser seems to be the one that everyone who has seen them seems to be the most touched by. I also think it's the most powerful. Dennis Liwewe was our most prolific football pundit and a great ambassador for the game and Zambia. It was an honour to interview him. 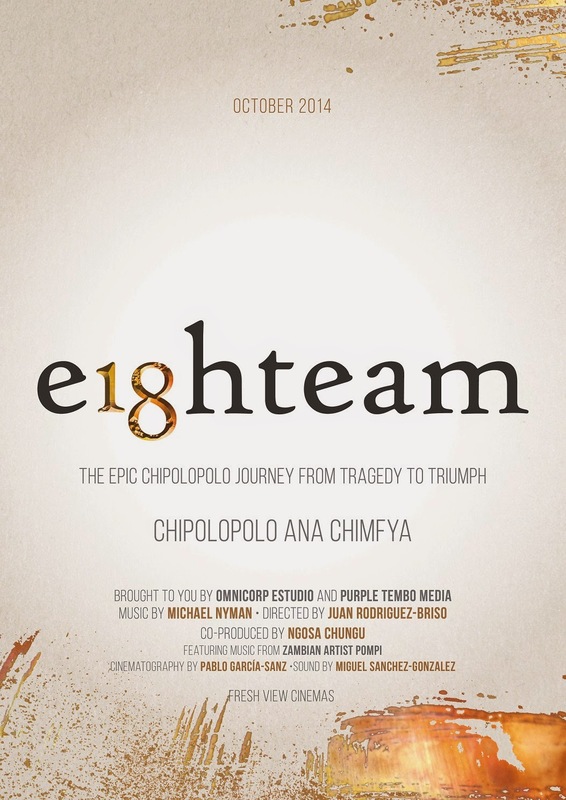 If you want to know more about writer, director and producer Juan Rodriguez-Briso, watch this Behind the Scenes video about his passion for football, how inspirational the story of the Chipolopolo is and about how we connected to co-produce e18hteam. We revealed our official poster for the film yesterday during #DidYouKnoWednesday. The exact release date is 17th October 2014 so mark your calendars and start saving your ngwees to make up the Kwacha you need for a ticket. Chipolopolo ana chimfya: The Chipololopolo triumphed in both Nyanja and Bemba. To keep up with all things e18hteam, follow the film on Twitter so as not to miss out on weekly #DidYouKnoWednesday event, and like on Facebook for exclusive content only posted there. You can find all my posts chronically my journey making e18hteam here.